Sometimes the variables of soapmaking can be so frustrating; colors and fragrances can morph and fade...the final soap can be so different from what you envisioned. It’s interesting to see how the actual processes used can also drastically change the final product, even when using the exact same recipe. Both of these soaps were made with the same recipe and contain the same fragrance oil, I like seeing the difference in color and texture that is achieved through the hot and cold processes. 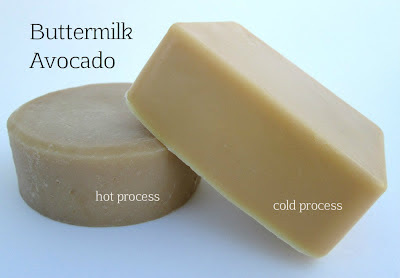 This is the first palm-free soap that I have tried, adapted from this SoapQueen recipe (I subbed buttermilk for the water and omitted the sea clay). Can´t decide which soap I would prefer. CP soap looks so silky and soft, but there is something about that HP soap that is so appealing. I'm with you Kirppu, there's definitely something appealing about each process, I really enjoy doing both for their different benefits. I've never tried to make HP soap before, but it is interesting to see how different processes produce different-looking soaps. Both look great! Thanks Jenny! I actually find HP soap easier for some reason, it also seems to be more consistent for me; although it definitely has it's limitations. You know what's really teasing my mind? Does different processes with having same recipes, make a difference in Ph values? That is a really great question Maja, perhaps I need to get my hands on some pH strips and do some testing! I have heard that HP soap has a lower pH, but I've never tested whether that is true or not. Ditto. Let us know,if you're testing them! they're both going to be really nice, especially with the buttermilk! I've made this also, based on the SQ recipe but used avocado puree, omitted the sea clay and also added a little shea butter. Mine turned out a little soft..just need to tweak it a bit more, but it's still real nice. I'm very impressed with your HP one..it looks so nice and smooth! Ah, so it is a little on the low side. If you end up trying it again, please let me know, I'd love to give this recipe another try! Both soaps look grate but the texture of HP is one of the smoothest that I’ve ever seen!